In historical terms, the day before yesterday is always the strangest and most remote. What was it like to live in the 70’s? It wasn’t that long ago in the grand scheme of things and yet I picture the decade in sepia - populated by horse drawn carts climbing cobbled streets passing old men in bowler hats scowling back as though the image would capture their souls. The tricks of memory. I grew up in the 1970’s. Despite the strikes, the oil crises and IRA terrorism, I remember it as a happy decade. Tim was ever to be found playing out on the street - no worries about cars or peodos in those days - endless games of football, cricket, making dens, short trousers, street parties, church parades; egg and chips. One abiding memory is that every August my parents would take my sister and I out into the countryside around Rochdale to pick blackberries. We would go armed with huge empty margarine tubs and come back with pounds of fruit – just waiting to be boiled up and made into soon-to-be neglected pots of jam. The weather was always sunny (I’m probably picturing 1976), the blackberries always plentiful, the thorns always benign. 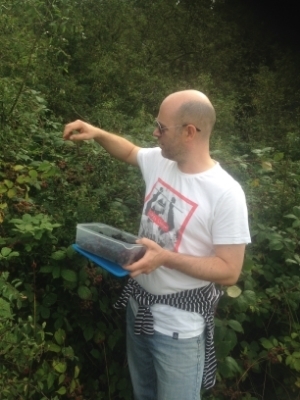 In honour of my upbringing, I take my kids blackberry picking. I’m lucky enough to live near the Sussex Downs and Ditchling Common. At this time of year, the bushes on the common are weighed down by juicy blackberries. My girls and I went on our bikes yesterday, Tupperware in my backpack, to grab some of nature’s high-summer bounty. The blackberry picking has become part of the ebb and flow of seasons in my reduced family; it’s what we do and my kids look forward to it. Probably the idea more than the reality, but that is often the way. Even now though – whilst this is actually happening - I can see that my girls’ nostalgia gene is awakening – as we bike to the Common we pass new housing developments that have laid waste to what were, ever-so-recently, green fields. The world is ever churning and nothing but memory stays the same. But creating those memories is at the core of our humanity. The remembrance and recreation of childhood memories – sights, tastes, rituals – is something that subconsciously draws us like an alcoholic to the bottle, the moth to the late night lamp, the sinner to the pew. With artists - and I include myself loosely in this group – it is one of the central drivers of creativity. The negation of childhood memories, to veer wildly away from familiar paths, works the same way. The quotation that starts this post is Happenings Ten Years Time Ago, a rare Yardbirds single from 1966 when the group – so briefly - boasted the duel lead guitar attack of Jeff Beck and Jimmy Page. But you knew that already, didn’t you? And the blackberries became a rather lovely homemade ice cream.